It's below freezing in each of the 50 states, including the Deep South, where the cold has already shattered records. NBC's Kevin Tibbles reports. A deadly, record-shattering polar vortex was beginning to ease late Tuesday, with temperatures expected to be closer to normal Wednesday, but its effects — thousands more canceled flights and power grids straining as people cranked up the heat — will continue to be felt for days. Wednesday will still be unseasonably cold across the central and eastern U.S., but by the afternoon, subzero temperatures will be gone pretty much everywhere but extreme northern Minnesota, forecasters said. All 50 states dipped below 32 degrees at some point Tuesday — even Hawaii, where it was 25 at the top of the Mauna Kea volcano, which is normally right at the freezing line this time of year. Schools and businesses closed for a second day. Single-digit temperatures were recorded at sunrise as far south as Georgia and Alabama, and parts of Minnesota were as cold as 25 degrees below zero. Records — not for all time, but at least for the date of Jan. 7 — fell in dozens of cities: 11 degrees below zero in Cleveland, 6 above in Atlanta and 12 above in Austin, Texas. A 118-year-old record was shattered in Central Park in New York, where it was 4 degrees, the coldest reading on the books for Jan. 7 and the coldest at any time since January 2004. Factor in the wind, and it felt like 31 below in Chicago, 16 below in New York and 45 below near the U.S.-Canadian border in Minnesota. "Cold enough to take your breath away," said Kevin Roth, a meteorologist for The Weather Channel. Forecasters said the effects of the system, a swirling mass of North Pole air that has pushed unusually far south, would be felt by as many as 187 million people — more than half the country's population. At least 17 deaths were blamed on the severe weather since snow and bitter cold started punishing the Midwest late last week, according to counts by NBC News, NBC stations and The Weather Channel. They included a 90-year-old woman who was found dead near her stranded car in Ohio and a 1-year-old boy who was killed in Missouri when the car he was in collided with a snow plow Monday. Deaths were also reported in Illinois, Indiana, Wisconsin and Michigan. They included people who succumbed to exposure and had heart attacks shoveling snow. Airports offered warmth but plenty of frustration. More than 2,600 flights in and out of U.S. airports were canceled Tuesday — almost 900 in Chicago alone — bringing the two-day total to about 7,000. JetBlue, which grounded flights at four airports in the Northeast while it waited for the cold to pass, started flying again but warned that there would still be delays. Homeless shelters were overwhelmed by people seeking shelter from the cold, which the National Weather Service warned was severe enough in North Dakota and Minnesota to freeze human flesh in five minutes. Amtrak had to charter buses to get some customers to their destinations. Three trains, all headed for Chicago and carrying more than 500 passengers in all, were delayed overnight, a spokesman said. The arctic air is beginning to retreat, with warmer temperatures on the horizon. NBC's Al Roker reports. Adding to the misery, parts of western New York were under a blizzard warning because of lake-effect snow blown around by wind gusts as strong as 40 mph, creating drifts 3 feet deep or more. Snow off the Great Lakes was falling as fast as 4 inches per hour — "actually so intense that we're getting little areas of thunder and lightning," said Carl Parker, a meteorologist for The Weather Channel. Chicago's Lincoln Park Zoo kept its polar bear inside. The zoo closed at 3 p.m. both Monday and Tuesday because of the extreme cold. On Monday — which set a record low for Jan. 6 of 15 degrees below zero — officials decided it was too cold even for Anana, the zoo's star polar bear, NBC Chicago reported. 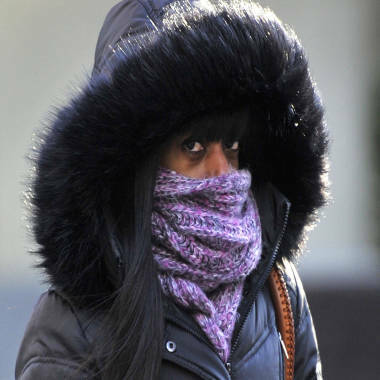 A commuter is bundled up against the cold Tuesday in New York. Sharon Dewar, a spokeswoman for the zoo, explained that because Anana has settled in the — usually — warmer climate of Chicago, she doesn't have the full, thick layer of fat she'd have on a polar bear's typical diet of seals and whale carcasses. But still: It was officially too cold for polar bears in Chicago. The cold caused water pipes to burst Tuesday at both Washington-Reagan National Airport — flooding the baggage claim area — and at George Washington University Hospital, flooding 33 patients' rooms, NBC Washington reported. Blood supplies were at critical levels, the American Red Cross said. About 240 blood drives had been canceled in 23 states by Tuesday afternoon because of the weather, leaving the Red Cross short by almost 7,000 blood and platelet donations. In Kansas City, Mo., the Pet Project's 250 kennels were all full with animals that had anonymously been dropped off by their frustrated owners or that had been found abandoned in the snow. A tabby cat left at the shelter had to be treated throughout the night and into Tuesday to make sure her body temperature remained stable, Tori Fugate, a spokeswoman for the shelter, told NBC station KSHB. "She had icicles coming out of her nose," Fugate said. "We see a lot of the animals who are dumped by the shelter because people are just not wanting to pay the fees." Alexander Smith and Erin McClam of NBC News contributed to this report.